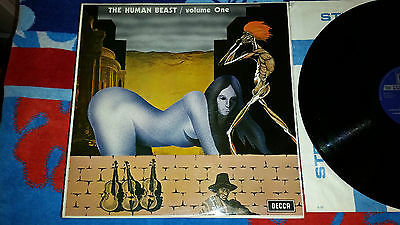 THE HUMAN BEAST - VOLUME ONE - DECCA 1970 UK VINYL LP NM-NM MONSTER PSYCH!! NR!! Okay Folks, here is one of the MONSTERS I've been mentioning in my other auctions.. This is a RARE GEM and the REAL DEAL. Up for your bid is the UK MONSTER and VERY RARE Psych LP: The Human Machine - Volume One from Decca Records. Conditions are listed below. Conditions:Thefront of the sleeve is laminated it is incredible it has been very well cared for and shows nosign of wear except for one spot under the chin of the "model" on the face there is just a very slight crease (The last picture will show it slightly, but it is very hard to photograph as it is very small), the edges are clean the opening has not frayed and the spine is square and straight. The reverse is clean and free from writing it has a hole punched out of it to display the colourof the inner sleeve (which is the blue in this case). The inner sleeve is original and intact. The vinyl is pristine it has been heavily scrutinized and is practically flawless the only exception being a very light spindle mark on the album label side 2, other than that, both labels are bright and clean and the silver print remains unblemished. This LP is part of a rare and unusual psych collection we will be auctioning off over the next few months, so stay tuned! Because of the rarity and value of this album, we will only ship it with full insurance to its actual value and with a tracking number. This is to ensure that both buyer and seller are fully covered in accordance with Ebay/Paypal rules. Hasty payments to avoid these insurance charges will not be accepted. All Buyers outside of the USAare responsible for all Duties and Taxes on item. We Will not ship "as a gift" or "duty free". Only serious bidders with good ebay ratings please.